domain, I kindly requests you to continue your support as ever. To celebrate the occasion I'm going to post something sweet, easy to make dessert which is made on stove top, though I came across many microwave method for the same. Frankly if u ask me, I din't do anything special, this was already there on my drafts,so just edited it. Have a good day ppl..
Take a wide bottomed non stick kadai , add the milk powder, condensed milk, combine well without any lumps. Transfer the kadai to the stove top on medium low flame and start stirring. Now add the 2 tbsp of ghee, soaked saffron milk and stir together well. Keep stirring until the mixture is bubbly , thick and starts leaving the pan. It would take around 8 to 10 minutes to get this consistency. Switch off the heat once it starts leaving the pan, do not keep the mixture anymore on heat else it won't yield a soft peda. Now allow the mixture to cool for 10 minutes.Handle the dough only when u can withstand the temperature. Grease the hand with ghee and start forming the mixture to a soft dough. Slightly apply ghee to the other hand as well, start pinching the dough little by little and form a soft, not cracked smooth ball. Press the middle of the ball with ur fingers just like u do for making thumb print cookies. U may take a look at the pic to see how it comes after u press in the middle. 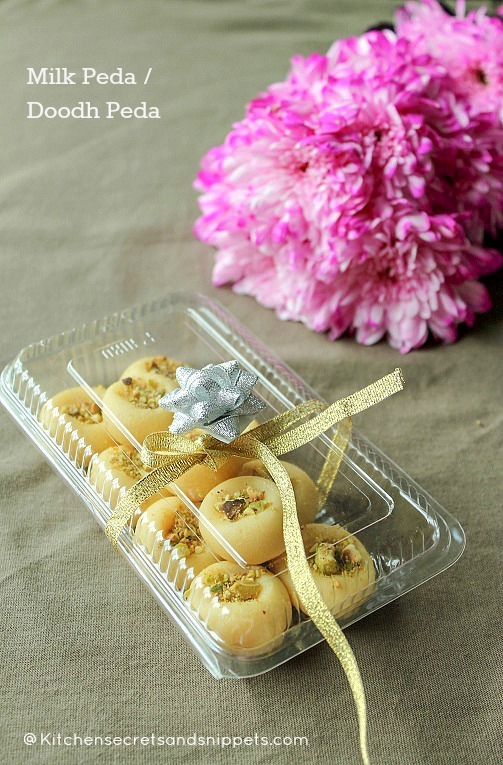 U may also spread the dough and roll just like u roll for roti, but slightly thicker, say 1/4" inch and use a cookie cutter to get cute shaped Milk peda's. What I've described here is the traditional shape for the peda's. Place the peda's in a greased plate or on a parchment paper and cover slightly until you are done with the remaining dough. 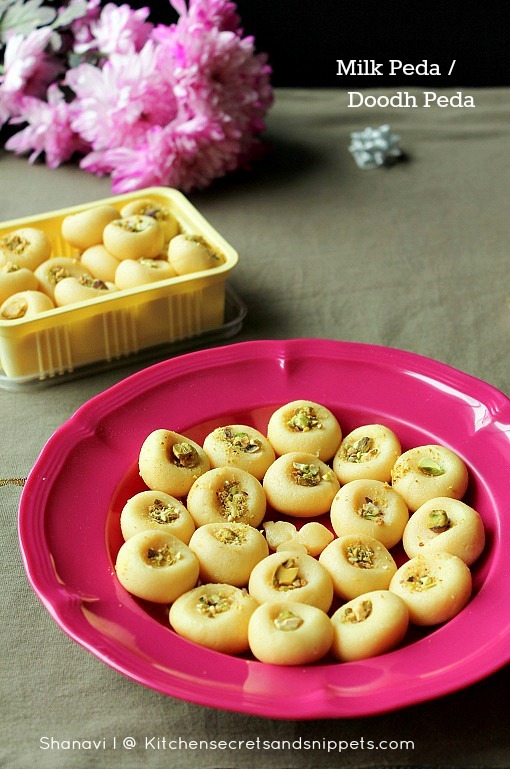 Place the crushed cardamom in the middle of each peda's and serve. Always store them in an air-tight container and use within 2 days. Keep refrigerated for longer use, say 1 week. Do not cook the mixture the way more than needed, else the peda's will crack and turns hard after making it. The right consistency is where when it starts leaving the sides, just switch off the heat and let it cool. Also the mixture will not be( very)sticky when u make the peda's if it is at right consistency. But if accidentally u have taken the peda mixture soon before it reaches the right consistency and you find it out while making peda's, no worries, Keep the mixture back on the stove(medium low) and slowly stir together for 2 to 3 minutes. 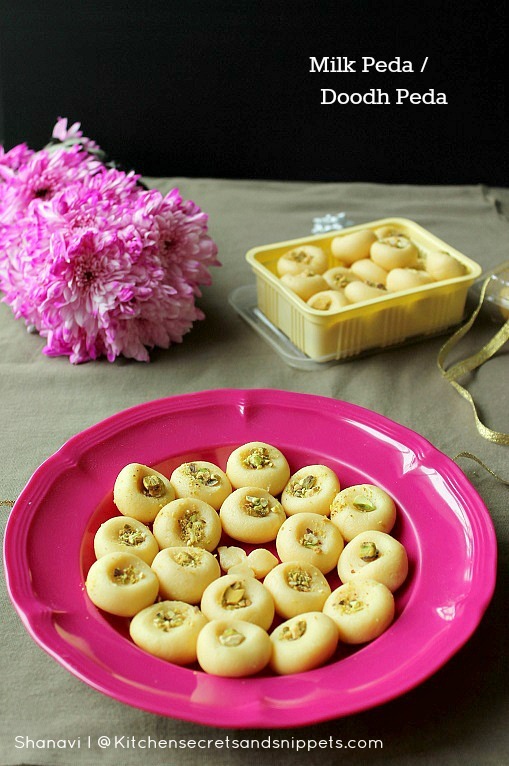 Again cool the mixture and try forming Peda's. This measurement yields around 50 peda's of the size pictured here, so choose the measurement accordingly. In case if it is hard after cooling, add a few drops ( really DROPS) of milk, knead well(mix well) and get on with the process of making Peda's. Add drops n drops of milk until u get the correct consistency. Always be near the stove and stirring all the time so that the mixture doesn't get burnt. When I tried for the first time, we thought the sugar has to be added little more and so the next time I've added around 1/3 cup and it was perfect for us. Again adding sugar is optional. Congrats on your new domain dear!!! Delicious Peda!!! lovely pictures..love this method..have tried using MW, should try using stove top..
Congratulations on your new domain! 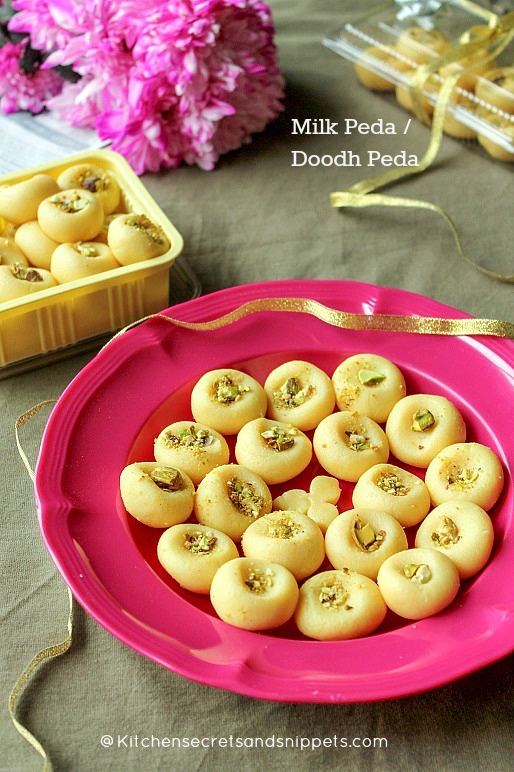 Your milk peda is absolutely drool worthy! congrats dear!! 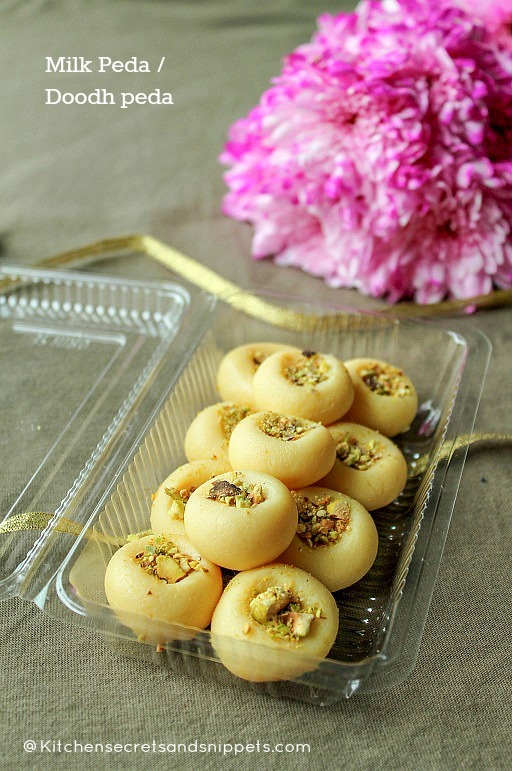 peda looks so yummm..looved ur all clicks!! congrats on new space.stunning clicks. Congratulations on the new home Sho!! this is a perfect sweet to celebrate... my favorite too.. I am literally drooling here.. Everything is perfect, Ippave sapadanum pola irukku..Congrats for your new home.. This is so colourfull post di.Looking great. do you use unsweetened condensed milk? Thanks for the share...Making this for durga pooja at a cousin's place.